Robin McIntyre, a nurse at Valley Hospital, serves on the bargaining team for the Service Employees International Union. Plinking and buzzing, the banjo rings sharp against the empty air of the steelworkers’ union hall. An acoustic guitar strikes up a timeworn rhythm as labor organizers, shop stewards and mill workers quietly mouth the words to songs passed down through generations. Under a dim fluorescent glow, a white-haired folk duo fills the early August evening with songs of historic union struggle, picket line heroes and hard-tested solidarity. Performing songs from the rise of organized labor in the 1940s, the singers call out tales of triumph and audacity. Their lyrics eulogize larger-than-life labor martyrs and commemorate pivotal battles against injustice. Tamed since its radical origins, the modern labor movement continues to face more conventional struggles. Outsourcing has undercut American manufacturing. Health care and pension costs have skyrocketed. And the recession has pitted workers against the unemployed in a resentful job market. Amid dwindling ranks, labor has shifted momentum from its traditional strongholds in construction and manufacturing over to public sector employees, health care workers and the service industry. But young workers still face new corporate challenges and a narrower path to the middle class. Between songs, guitarist George Mann takes note of the primarily white, middle-aged makeup of the audience. The face of labor is changing, he says, and union organizers need to reach out to the next generation — before it’s too late. As he starts into another song, Mann encourages his audience to sing with him, to echo more than 150 years of proud history and righteous discontent. Like any union, a chorus grows stronger with every new voice. rganized labor has deep roots in the development of American industry. Dan Wilson, president of Spokane’s United Steelworkers Local 338, says the Greatest Generation leveraged labor unions to carve out the middle class in the wake of World War II. Empowered to negotiate wages and benefits, unions helped set the new standards for the American Dream. State Rep. Timm Ormsby, who serves as president of the Spokane Regional Labor Council, says unions brought democracy to the workplace. From miners to teachers to firefighters, labor unions have long advocated for better pay and improved working conditions for all, historically helping to win the minimum wage, the eight-hour day, overtime pay, worker’s compensation and sick leave. “There are a lot of spillover benefits for working folks that have no affiliation with the labor union,” he says. But union membership has steadily dropped since its peak in the 1950s. Once representing approximately 35 percent of the workforce, unions now represent just 11.3 percent, according to the Bureau of Labor Statistics. In Washington state, which has the fourth-highest rate in the country, union membership fell from 19 percent in 2011 to 18.5 percent last year. Without union protections, Wilson fears workers could face a downward spiral of weakened contracts and deflated wages that would drive America further from its middle-class dream. He says unions help ensure a fair day’s pay for a fair day’s work. A longtime member of the cement masons union, Ormsby says he has watched the recession hit local workers hard, accelerating the economic shift toward service industries. In response, labor activism has to move out of the factories and foundries into the hospitals, classrooms and government offices. Robin McIntyre stands among the up-and-coming ranks of new labor. 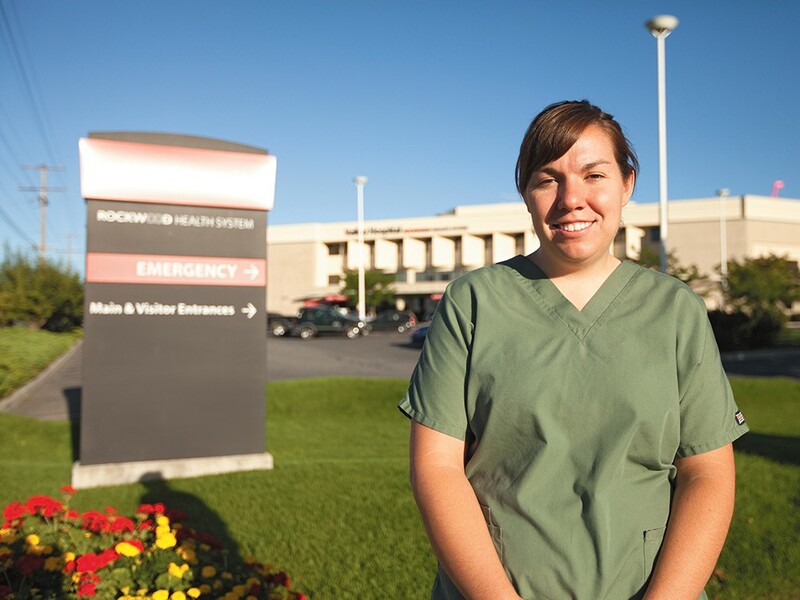 A nurse in the Intensive Care Unit at Valley Hospital and Medical Center, she serves on the bargaining team with SEIU Healthcare 1199NW, a regional affiliate of the Service Employees International Union. Growing up in a union household, McIntyre had heard the old songs and tragic stories of labor’s historic struggles. As a nurse, she came to recognize the union’s important everyday functions, providing an infrastructure to discuss patient care, monitor job performance and air grievances. Unions hold both employees and employers accountable, she says. They ensure that workers receive proper training and safe working conditions. They protect employees from retribution or abuse. They offer support and guidance. “I can’t imagine not having that backing,” she says. In a renewed effort to recruit young workers, Washington unions have recently encouraged new groups like Young Emerging Labor Leaders (YELL). Amy Cowin and Duane Cooper, organizers with the Spokane YELL chapter, say it will take determination and innovation to carry labor’s promise to the next generation of workers. A city garbageman and shop steward with one of the region’s largest unions, Cooper says baby boomers have left a large gap in institutional knowledge and employment opportunities. Nationwide, corporate profits have ballooned while worker salaries have stalled. Widespread unemployment has fueled resentment toward unions and undermined worker confidence. In the wake of the recession, workers need more support than ever, they argue, remaining optimistic that organized labor can rebound with the help of technology and increased networking. Organizing young workers will take public education and outreach. They need to pass on the history and lessons of the labor movement’s successes. One of the most widely beloved labor anthems traces its origins back to Spokane. Penned by legendary organizer and songwriter Joe Hill, “The Preacher and the Slave” immortalizes the 1910 “free speech fight” in which union workers flooded the city’s jails to protest unconstitutional laws against making political speeches in public. Ormsby, with the regional labor council, says Spokane still possesses that independent community spirit. This city works harder than ever, he says. And while they might not sing as much, the words still ring true. In the quiet of the steelworkers’ hall, Mann strums the opening bars of “Solidarity Forever” as the audience claps in time. Soft and then slowly building, whispers grow into hearty cheers. A few among the ranks rise up from their chairs and stomp their feet. Their knuckles curl into fists as they hoist their arms high and shout along with the words.